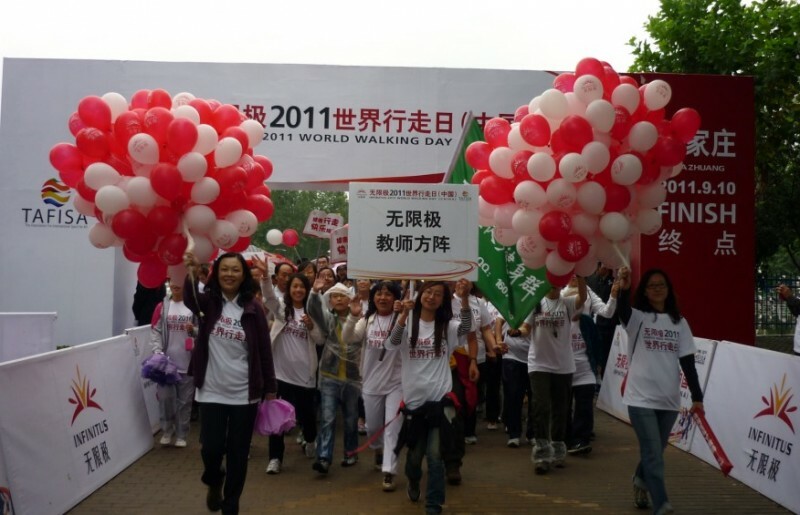 2011 Infinitus World Walking Day (China) was held in ShiJiazhuang, Hebei Province on Sept 10th. More than 6,000 citizens followed by the World Shooting Champion Yalin Cai walked 6,000 steps in Century Park. This event promotes scientific walking fitness values and encourages all people to participate in walking for health. As the event day was the 27th National Teachers’ Day, 240 teachers from ShiJiazhuang primary and middle schools with 50 'Hope' primary school students were invited to attend this event. Besides, celebrating the Teachers’ Day, the organizer aimed to call public attention to the sub-health problem of teachers. Although it was raining, the participants walked with great passion, and a smile of pleasure passed across their faces. The representatives from Lingshou County Zhainan Infinitus Hailian Primary School attended the event as well. The students gave their teachers the special gifts in terms of healthy walking. The organizer particularly organized some volunteers to accompany students to complete the event, so as to ensure them against potential danger of walking. Moreover, the organizer donated some books and sporting goods to the teachers and students.